So far, the player of the European Under 21 Championship is undoubtedly one man. Spanish star Isco has wowed fans with his array of silky skills and it looks almost certain that now the Malaga midfielder will be on his way this summer. Manchester City and Real Madrid are rumoured to have already tabled bids for the 21-year-old attacking midfielder. He revealed earlier this week to the Telegraph: “Those [Alvaro Morata, Nacho and Daniel Carvajal] indeed are the guys insisting [for the move to Real Madrid]. We’ll see what happens. I try to draw the line there. We have the [European] Under-21 final and need to focus all five senses on that now. “In seven days I will decide my future. After the U21 Euros I will analyse my situation and make the best choice for my future. At the moment I am calm and focused on my work with the national team. 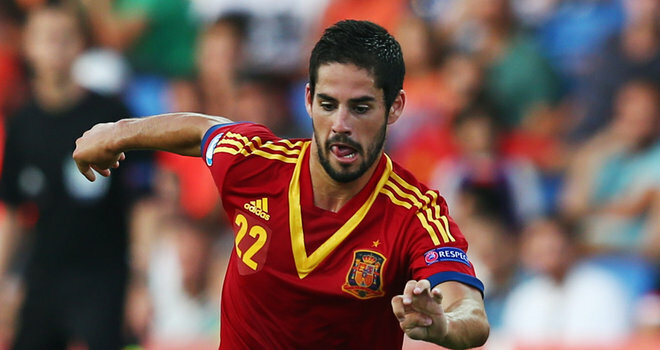 Isco has played for Spain at every youth level as well as making one senior appearance against Uruguay earlier this year. Take a look at the selection of videos below, that all show some of his best form from the tournament.